This makes Asked & Answered something that has never been done before with a television show: an oral history IN REAL TIME. No revisionism. Nothing forgotten. No detail spared. Because this dialouge with fans starts in 1991, it pre-dates the production of the Babylon 5 pilot, so you’ll discover JMS’ complete vision for the series, many aspects of which never made it to the screen. As the cover notes, this is only part 1. There will be 5 parts (hmm,coincidence?) to this series. Part 1 is red, the same color as the first Babylon station, and Part 5 is blue, the same as the fifth Babylon station. I’m not sure about the color of the middle volumes. No word yet on the possible electronic index they mentioned on the podcast. Gary, as I understand, there are no colors assigned to the middle volumes. Volumes 2 and 3 spontaneously combusted at the printers, and the manuscript for Volume 4 mysteriously vanished. From Jan (Scripts Team): The basic appearance is the same white, only the title and part # colors will be changing. Assuming JMS approved them, the colors should be red, gold, purple, green, blue. Hehehe.. I found the cover really poorly designed.. Not really anything that scream Babylon 5….. It would be great if we could hear from some people who ordered the books what they think of them. I have all the previous volumes of the series, but these books have not yet looked convincing enough for me. For the most part, I am with the crowd that would love to have them as a digital edition. I find that I use the internet most times when I look for B5 quotes and not the book. The only time I used the book so far was when my internet connection was down (oh, what an awful day). So, any _critical_ listener feedback on the books yet? The first book looks really nice. Somehow seeing it in print, it is a lot better than I thought it would be. It is perfect for just randomly opening and getting absorbed into something. 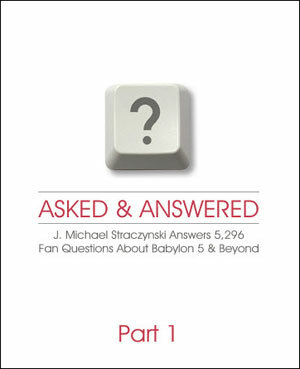 JMS did write a introduction for the first book.